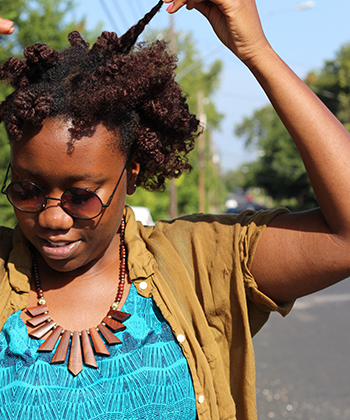 Do you usually use oil in your natural hair routine? 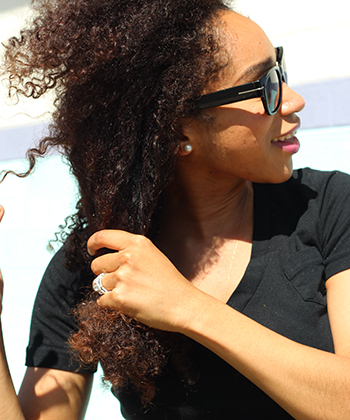 Evelyn: I usually use olive oil or coconut oil as a pre-poo treatment to soften & detangle my hair before cleansing. 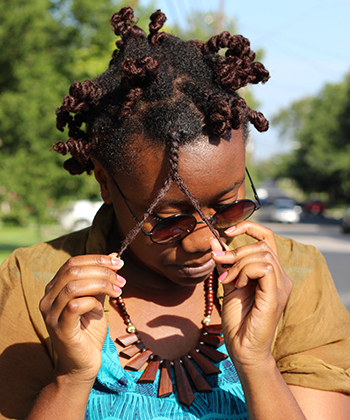 I also use a little to take down my twists or bantu knots. Oils are also great for doing blow outs. 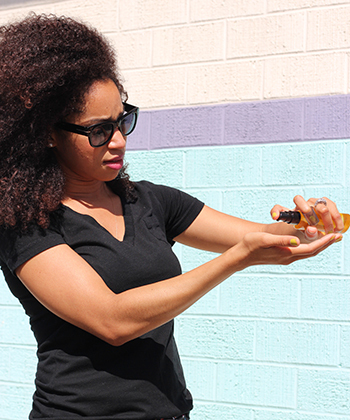 How did you use the Suave Professionals Moroccan Infusion Moroccan Argan Styling Oil in your hair? 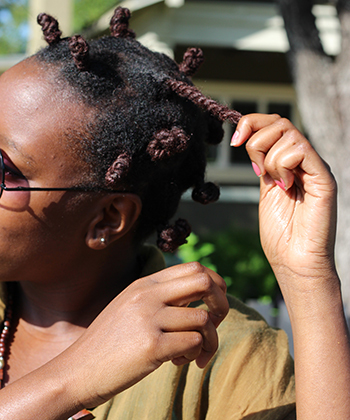 Evelyn: To take down twists or bantu knots in the morning, I use about 2-3 pumps of the Suave Moroccan Argan Oil. After emulsifying it in my hands, I run it down the length of each section. How did your hair feel after using it? Evelyn: My hair felt super smooth and soft. Not greasy, which is important because I have fine natural hair. In this photo, I'm untwisting each section with the oil on my fingertips. Any tips or advice for other people considering trying out this product? Evelyn: Use less than you think you need. Coily hair types will need more than the package's directions suggest, but a little still goes a long way. 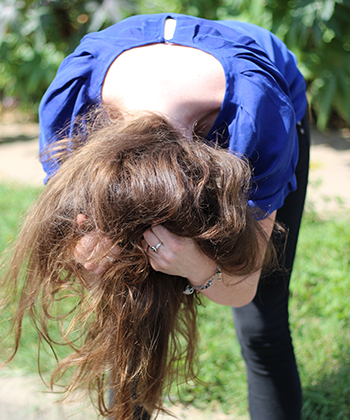 In this photo I'm fluffing my hair to give it the desired shape and texture I was looking for. 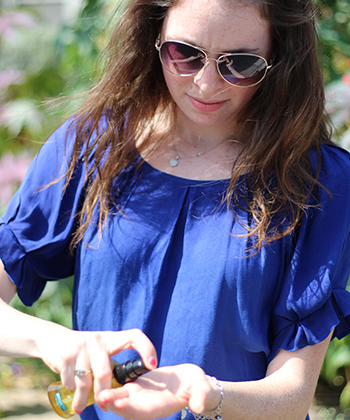 Clare: I mostly use oils to add shine and softness to my wavy hair. 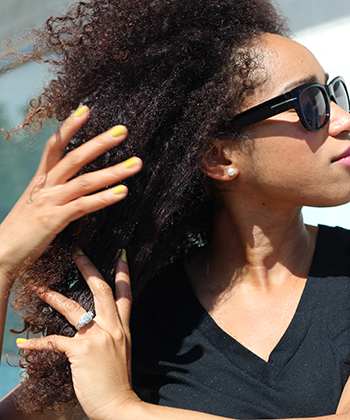 I tend to like light oils that won't weigh down my Type 2A hair. Clare: I like to use this oil as a finisher and applied it to my damp hair after getting out of the shower. If my hair is dry and in need of some shine, I rub the oil between my hands and then scrunch it through the ends of my hair as I'm doing here. 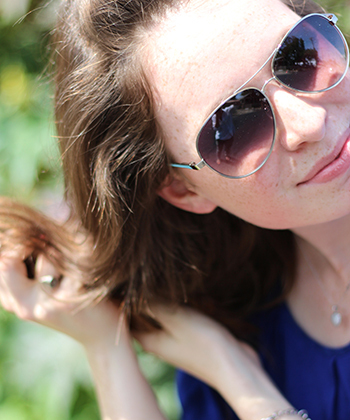 Clare: It improved the look and feel of my hair especially the ends, since my hair is in dire need of a haircut. In this picture I flipped my hair forward to make sure I evenly distributed the product through my ends. 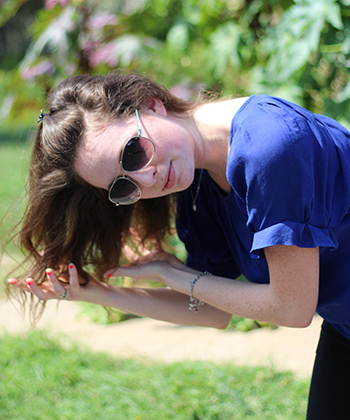 Clare: If you have wavy hair like me, just focus this product on your ends. Definitely don't apply this anywhere near your roots. Experiment with the amount your hair likes, but if you have Type 2A waves like me I would start with just one pump to begin with. Nikki: I like to add olive oil as my deep conditioner, I've also used Moroccan oil before but it can get expensive. 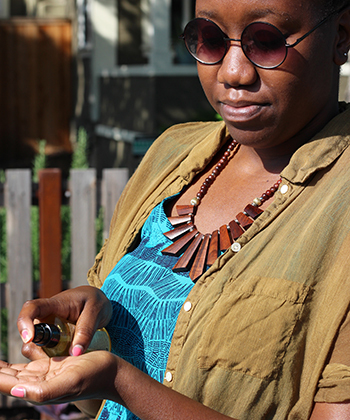 Suave Moroccan Argan Oil is a great alternative to the pricier products. Nikki: I squeezed a few pumps into my hands, rubbed my hands together to emulsify the oil, and then applied it to my hair in sections. Nikki: It smelled great, and looked shinier for sure. As you can see in this picture I didn't run my fingers through my hair because that would break up my curls. Rather, I just smooth my hands over my hair with a little bit of oil on them. Nikki: Everyone's hair is unique, so it's hard to give advice about what someone else's hair might like. But if you have thick, coarse hair that's a mix between Type 3B and 3C like mine, I recommend smoothing it over the length of your hair for some added shine.